Ex-SEPA simplifies the creation of electronic direct debit data for transfer to banks. The Excel macro reads the necessary data from Excel or Access files and implements for processing by the bank. Basically ex-SEPA will do the same job as ex-dtaus.xls the same manufacturer, but just optimized for the European cashless payment method. 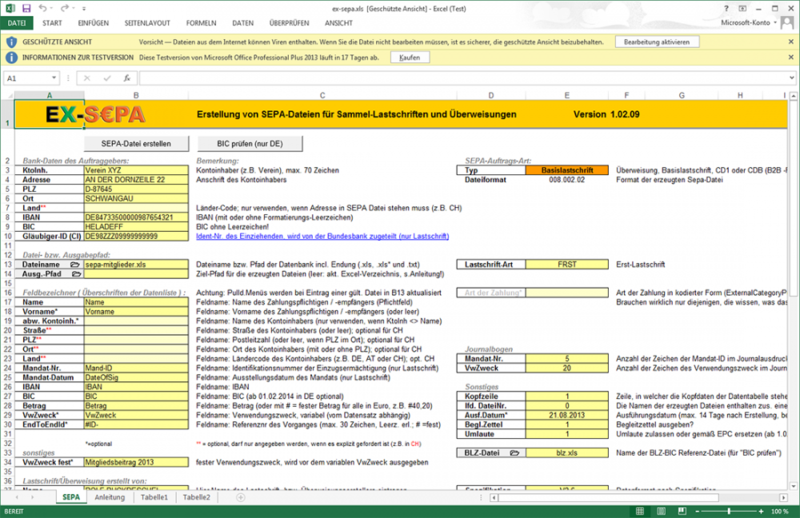 In addition to the banking data, the macro generated documents such as the Beizettel and collection lists, which also require the banks. Also on board ex-SEPA also has an inspector for the BIC keys. This is part of the IBAN code and identifies the offices of financial institutions. Many other banking and finance tools available for free download includes our software catalog. The trial version is limited to seven records.